18 South Florida ladies and one lone, brave man who shared a passion for and devotion to the arts met over their weekly lunch to discuss how they could make a difference. South Florida was rapidly emerging as a powerful cultural force, attracting national attention and incubating talent on all levels in all areas, from dance to music to theatre to visual arts and more. The group understood that it would take dollars to help artists, students and organizations continue to hone their craft, which in turn would keep South Florida from ever again being the cultural wasteland it once was. The organization's name conveys exactly what our members are -- CITIZENS INTERESTED IN ARTS. Incorporated as a 501(c)3 nonprofit organization, CIA is a 100% volunteer army of compassionate, creatively oriented individuals who tirelessly donate their time and raise money for one reason and one reason only -- to fund The Grants Program. 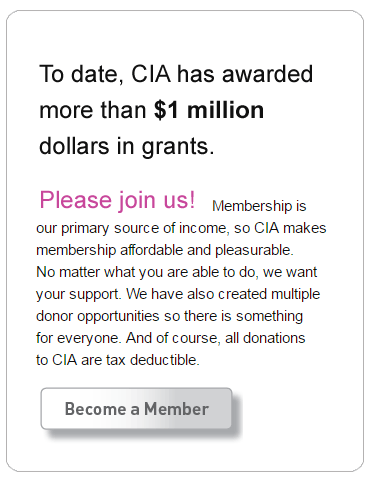 The Grants Program is the heart and soul of the CIA, with 100% of donations going to writing grants. In 1998, the first grants were awarded to two young aspiring opera singers from The New World School of the Arts to attend the Aspen Summer Music Program. They had been awarded scholarships for all the classes but did not have the funds to get there or pay for housing or food. CIA grants subsidized their needs.